Join us for our 42nd annual Yuletide Fair on Saturday, December 1, 2018, as we celebrate the holiday season! The school assembly hall will be transformed into a winter wonderland with dozens of original gingerbread creations on display. Children and adults are invited to enter this year’s Gingerbread Contest, a perennial favorite of the fair. Friends, families, and neighbors will have an opportunity to bid on their favorite entries at the Gingerbread Auction – take home an original work of gingerbread art and support Hawthorne Valley Waldorf School! Interested in participating? Click here for details and entry forms. Enjoy activities for children, visit the Community Craft Room for handcrafted items and the Hand to Hand Room for gently worn wool clothing and wooden toys, and stop for a tasty treat in the Cozy Café. Dozens of artisan vendors will fill the school’s classrooms with beautiful handcrafted items ~ you’re sure to find the perfect gifts for everyone on your holiday shopping list! Update as of 11/10: Our vendor spaces for the 2018 Yuletide Fair are now full! Tiny Treasures Room, Rose Kindergarten Classroom – This kids only room is full of wonderful handmade treasures and treats. Let kids experience the wonderment and magic. Pocket Person, Fair Campus – walks the Fair in a lavish cape filled with pockets of handmade items waiting to be chosen by expectant people of all ages. Children’s Craft Room, The Music Room – Kids make creations from tables full of natural materials. Creativity will be flying high in here! Cozy Café, Art Studio – Baked goods, hot drinks, soup, and live music by local musicians, great people, and great conversation. And, you get to take a load off and kick your feet up! Community Craft Room, 5th Grade Classroom – Handmade gifts for sale made by students, parents, and friends, including wooden toys made by gnomes and other beautiful and festive items. Main Food Tent, Outside of the Teaching Kitchen – Delicious homemade food and warm drinks are served. Stained Glass Making, Chemistry Lab – Dabble in making your own stained glass creations. Candle Dipping, Candle Dipping Room (Loft Level) – Local musicians play melodic tunes while community members of all ages quietly walk in a circle dipping sweet bees wax candles. Hand to Hand, Upstairs in the 2nd Grade Classroom – Donated, lightly used woolens, sweaters, blankets, coats and other cold weather gear are for sale. Plus, used wooden toys and games. There is something for everyone! Book Sale, Upstairs in the 2nd Grade Classroom – Lightly used books for sale for the bookworm. 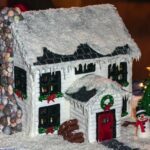 Gingerbread House Auction, School Hall – view the creations made by the local community all day. Live music and goodies abound! HVS Silent Auction, 1st Grade Classroom – spend some quiet time bidding on local artisanal and handmade crafts from the local community. These are bespoke and gorgeous items donated by our generous artisans and local businesses. Artisan Raffle, This will be taking place during the Fair alongside the Gingerbread Auction in the School Hall. Tables will be set up against the wall with Vendor raffle prizes displayed. Raffle ticket purchases are made next to tables and raffle prizes called nearing the end of the Fair.